Restaurant Review: Jedediah Hawkins Inn. 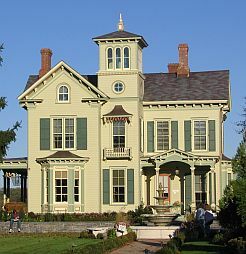 Jedediah Hawkins Inn offers fine food and lodging in a meticulously restored sea captain’s house on 22 park-like acres. It is the perfect place for a romantic dinner, weekend getaway, or both. I’ve wanted to tour this building (also known as Captain Hawkins house) since it opened to the public in 2004 (way before the restoration was complete). 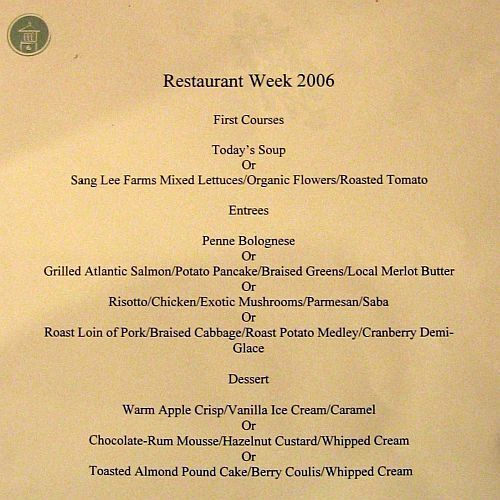 I missed a few chances, but with Long Island Restaurant Week coinciding with my annual mini-vacation in Greenport the timing was perfect and I called for a reservation. Seating was scarce so we had to juggle times and dates. No matter how many balls we had in the air, Hostess Maryellen was relaxed, helpful, and made me feel as though she had all day to help me. That was the beginning of a truly wonderful dining experience. You can’t tell by looking at it now, but only a few years ago Jedediah Hawkins Inn came very close to demolition. Privately owned since 1949, the estate fell into disrepair and was condemned by the fire marshal in 2003. Local builder Jeff Hallock (who’d wanted to save the house since he was a kid) and Great Neck Oncologist Dr. Frank Arena bought the estate and began a restoration project that would ultimately take 3 years to complete. No expense was spared and no detail overlooked. The result is historically accurate and spectacular. The Jedediah Hawkins Inn, outbuildings and grounds are stunning. Eating at Jedediah Hawkins Inn was a wonderful experience. From the reservation call to dessert everything was perfect. I wasn’t surprised. 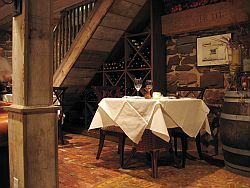 Left: A table in the Captain’s cellar (note the wine rack). Since well known Long Island chef Tom Schaudel is executive chef and a partner, you might say this Long Island restaurant only lived up to expectation. We arrived on time and were seated immediately. As we walked to our table I noticed a very busy staff, but they didn’t seem stressed, rushed or confused. I hate that feeling in a restaurant and was glad I didn’t sense any of it here. Our table was in the Captain’s Cellar, a less formal, but no less attractive part of the restaurant. 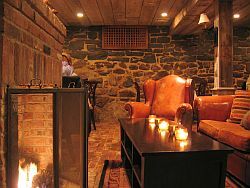 Right: Casual seating around the fireplace. In the Cellar you can order burgers and American tapas from a tavern menu, but since this was Long Island Restaurant Week, we ordered from the prix fixe menu. 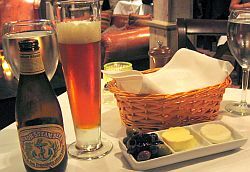 Along with our drinks came a basket of bread with a tray of pitted olives, butter, and goat butter. The butters were from Catapano Dairy Farm, Long Island’s award winning goat dairy. I guess I eat way too much supermarket butter because I was pleasantly surprised to find these butters salted only enough to bring out the flavor rather than overpower it. The goat butter was a nice touch and the novelty of it was hard to resist. As good as it was, we hardly touched the cow butter. Our first course was fish bisque for me and salad for Karilyn. Everything about the bisque—flavor, color, texture and temperature—was perfect. I’d order it again. The salad was a mixture of lettuce and organic flowers from Sang Lee Farms. 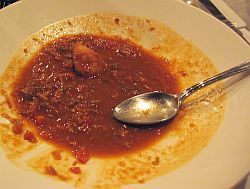 Right: The tomato based fish bisque was excellent. That large lump is a potato. The smaller pieces are fish. We enjoyed the salad, but heck, it’s a salad and I prefer meat in my dish—I just can’t say much more about it. Karilyn’s entrée was roast loin of pork with braised cabbage, a roast potato medley and cranberry demi-glace. I know what you’re thinking already—the pork is going to be overcooked. Although it was well done it was far from overcooked and still quite tender and juicy. Karilyn and I both loved it. The cranberry demi-glace was a welcome upgrade from the traditional apple sauce and while potatoes generally don’t breed excitement, these were probably the hit of the dish. Roasted and seasoned to perfection the medley included whole, yet bite-size purple potatoes. I couldn’t stop eating the darn things. Grilled salmon and roast pork. The plates are huge making the portions look small. They weren’t—just look at the spoon compared to my plate. 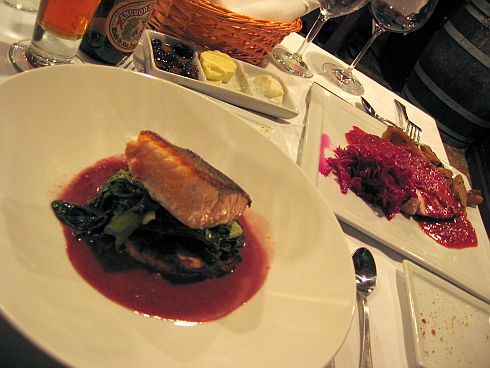 In my plate were grilled Atlantic salmon with braised greens and a potato pancake, all stacked on top of one another and sitting in a merlot butter sauce. I’m a purest when it comes to fish, so I was very happy to see the salmon on top of the stack rather than swimming in the sauce. That gave me the chance to enjoy it alone as well as in various combinations. The salmon was cooked slightly more than I’d make it at home (I like things very rare), but most people would have called it perfect. Its skin was thin, crisp, and lightly seasoned. The combination of salmon, greens and merlot butter sauce was wonderfully seamless, and the crusty potato pancake brought a satisfying texture to the dish. I washed the salmon down with Anchor Steam beer while Karilyn drank the house cabernet. Admittedly, we could have made better choices here and usually we do. We started off with these drinks to just wet our whistles and somehow they stayed with us throughout the meal. The wine list at Jedediah Hawkins Inn seems comprehensive with something from each Long Island winery and wines from New York, California and the rest of the world. 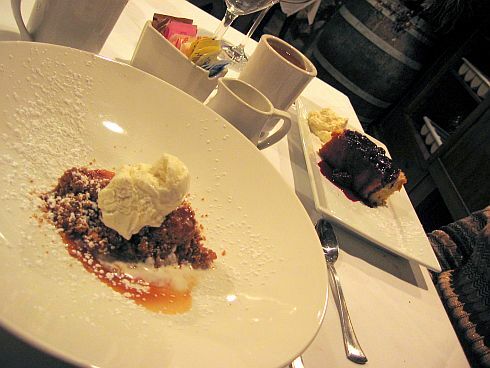 Apple crisp & toasted almond pound cake. Again, the portions are reasonable, the plates are just huge. That's really my only complaint. The dinnerware was large enough to be in the way and we kept clanking into it making a racket. Our entrée portions were ample yet allowed room for desert. I’m a sucker for apple crisp; Karilyn had the toasted almond pound cake. We shared, had trouble choosing a favorite, and by the time we were finished, we were finished—not even room for a wafer-thin mint. The service we received throughout the evening was outstanding. Kyla, our waitress, was attentive, patient, courteous, and answered all of our questions without pause. I’d like to see more waitresses like her on the Long Island restaurant scene. I haven’t actually stayed here myself, so all I can give you is a quick look. There are 5 rooms and a suite to choose from. All are luxuriously decorated and overlook the beautiful grounds. Amenities include wireless Internet, flat screen TV and continental breakfast. On the grounds you can relax on the porches or enjoy some quite time by the pond. Prices range from $325 to $550/night. Jedediah Hawkins Inn is located in Jamesport on Long Island’s picturesque north fork. To get there find your way to Route 25 and take that to Jamesport Avenue south (about 6 miles east of the Riverhead traffic circle). Jedediah Hawkins Inn will come up quickly on your left. If you’re at Jedeiah Hawkins Inn you'll probably want to explore Long Island Wine Country and do some wine tasting. Also in Jamesport is a nice little tea house called Tea Time Cottage. Or you might peek at my wine events calendar for additional things to do.